Two men who allegedly robbed the home of an accountant of Navua in September appeared in the Suva High Court this morning. Nacanieli Bakata is charged with aggravated robbery, theft and theft of motor vehicle while Ilaitia Vuivuda is charged with aggravated robbery. The two are charged together with Taitusi Delai and Josaia Dobui who were not present in court today. The prosecution served disclosures to Bakata and Vuivuda. 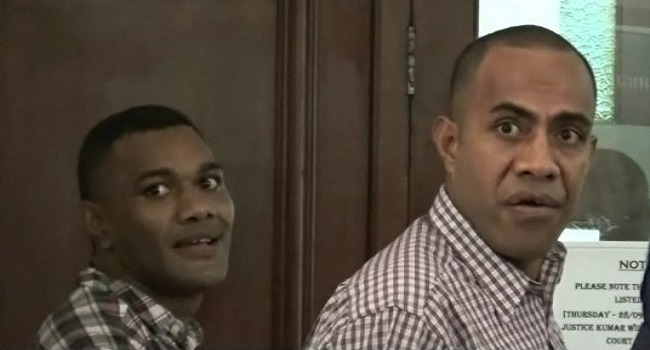 It’s alleged that Delai and Dobui together with Bakata and Vuivuda entered the home of the accountant and stole assorted items worth over seven thousand dollars as well as their family car in the early hours of September 15th. It’s also alleged the four were armed with kitchen knives and iron rods and allegedly threatened and tied the complainants with cello tape. As a result, the victim’s sustained injuries. The duo have been remanded in custody. The matter will be called on 27th November.